It can be easy to get all caught up with the daily grind making deadlines and moving onto the next big project, but I implore you to keep in mind that success is not crossing the finish line it is taking one step after another in the direction you want to goal. Making goals is not a negative action it is a god thing but when we make and focus on goals we can sometimes forget how we get there, which is one step at a time. The Budha says “Do not dwell in the past, do not dream of the future, concentrate the mind on the present moment.” Now the origination of the quote has been highly debated however the philosophy of living in the moment and being present in the moment is a philosophy shared by almost every major religion. 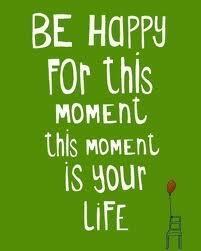 When we live in the moment it helps with our gratitude. Being grateful for where we are at right now is a powerful tool. Being grateful will help you gain a clear mind and perspective and can influence others as well. When we live in the moment it helps us focus on what is right in front of us. Successful people all do this. They focus on the job they are doing. Successful people never multi-task. Finally living in the moment helps us gain perspective on what success is. Success is completing each step. Popular culture and mans desire to apply some type of taxonomy to everything has maybe blinded us to what real success is.